P.square loses Dad... Lola-omotayo pays tribute on instagram. P.square, Paul & Peter Okoye lost their father, Mazi Moses Okoye on Monday, two years after losing their mum. Our dearest “Gradpa Jos” it was just a week ago we were all hanging out with you, your grandchildren were running around you and playing with you. Cameron, Andre and Aliona all wondering why you had a cast on your leg and Cameron was playing with your crutches….Your warm smile and your energy kept us going. We were all happy that you were strong. You made us all laugh. This was the last thing we ever imaged. We are still in shock but we cannot question God as He knows best. 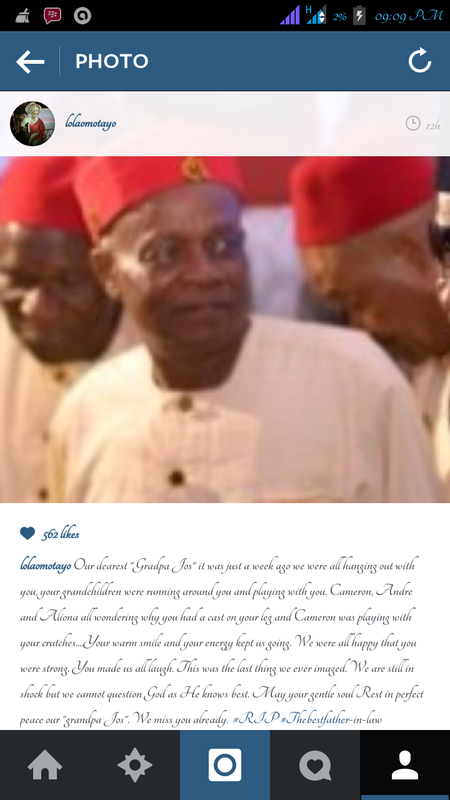 May your gentle soul Rest in perfect peace our “grandpa Jos”. We miss you already. #RIP #Thebestfather-in-law.